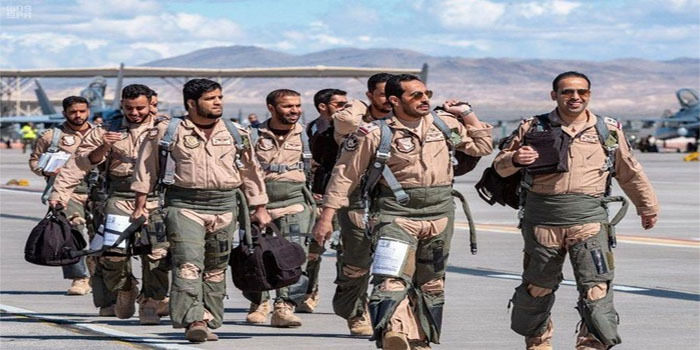 The Royal Saudi Air Force concluded its “Red Flag” military exercise in the US on Saturday, which saw more than 800 sorties carried out by the unit. The air force conducted a number of combat scenarios in a real combat environment in which Saudi pilots demonstrated their high combat capability and rapid ability to deal with enemy targets and destroy them. The Commander of the air force participating in the exercise, Col. Masoud bin Nasser bin Shri said that participation in the exercise aimed to deepen the bonds of cooperation and exchange of experiences between the air forces of the participating countries, and increase the level of combat readiness and skill and develop of its officers. Col. Bin Shri confirmed that the air and technical crews achieved outstanding success and high level of accuracy and professionalism, with all flights successful. He added that these exercises would be of great benefit to the participants of the air crews, and technical and administrative crews to develop their skills and skills and gain self-confidence and good practice in real life battle situations.